Type 3 solder paste is generally considered to be the industry standard that will work for most printing applications. The use of Type 4 is really only needed for particularly fine-feature printing, where the Type 4 will produce better release and a more consistent volume deposit. 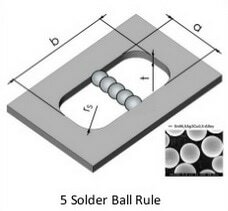 The point at which Type 4 solder paste should be considered over Type 3 solder paste in printing applications is generally in the range of a 9-mil stencil aperture width for most pastes, although other variables such as paste chemistry, stencil thickness and other printer parameters can have an impact. This means that Type 3 paste will generally work well down to an aperture with an opening of 9 mils or greater. For apertures that are narrower than 9 mils in width, the user is best off using Type 4 paste to assure consistent release from the stencil. Since Type 3 paste has a specification of 25 - 45 microns (roughly 1.0 - 1.8 mils), you can fit 5 of the largest powder particles across a 9-mil stencil aperture (5 particles x 1.8 mils per particle = 9 mils). If the aperture were any smaller than 9 mils, the Type 3 paste would fail the Five-Ball Rule and the user should consider Type 4 powder instead.